What Do You Need to Know About Your Heat Pump Compressor? "Should I Buy a New, Off-Brand, or Refurbished Heat Pump Compressor?" In conclusion, it is worth checking out the price of both an equivalent model and an off-brand model. If the price difference is minor.go with the equivalent model. While most off-brand compressors do just fine, some do not. As a result some homeowners have had to spend more money in the end because the heat pump compressor failed more quickly. When problems with the compressor exist, one or both of the above functions are affected. Is there a difference between a compressor in a heat pump versus a standard air conditioner? 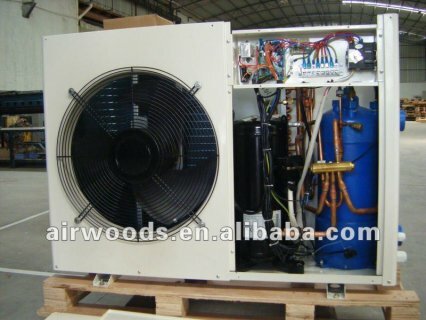 In fact, a compressor used in an air conditioner can be equally exchanged with the compressor in a heat pump (as long as the heat pump compressor performance for the cooling side of each is the same, as well as other criteria such as pressure differential and refrigerant type). Most modern heat pumps utilize a scroll compressor, as this is typically the quietest, most efficient compressor for residential and small commercial applications. Below is a fantastic video from Copeland, one of the largest scroll compressor manufacturers in the world. It doesn't have any sound explaining the process, but it is somewhat intuitive. Just note for the video: the blue gas is the low temperature/low pressure refrigerant entering the compressor and the red gas is the high pressure/high temperature refrigerant leaving the compressor. "What Does a Bad Compressor Sound Like?" There are many, many different noise that come from a heat pump compressor which can help to diagnose problems. First let's hear how a good compressor sounds. You will hear slight fluctuations in noise as the compressor loads and unloads. Next this is a good example of a compressor that is going bad, but still operating. When a compressor shuts down, internal equalization can cause the compressor to "backspin" if the check valves are non-existent or not working correctly. Below is an example of what this sounds like. McQuay International is a global corporation that designs, manufacturers and sells heating, ventilation and air conditioning (HVAC) products, systems, parts and services for commercial buildings. Since 2006 McQuay has been a subsidiary of Daikin Industries, Ltd.
http://www.cqmi.fr/ rencontre jeune fille ukrainienne.